Republican Senate candidate State Sen. Joni Ernst makes a statement to the media after her debate with Democratic Rep. Bruce Braley at Simpson College in Indianola, Iowa, in September. Among the most hopeful signs for Democrats this year have been the strong fundraising totals for their Senate candidates. Through June 30, the Democratic incumbent Mark Udall of Colorado had raised $7.9 million in individual contributions to $3.2 million for his Republican opponent, Cory Gardner. In Iowa through the same date, Democrat Bruce Braley had raised almost three times as much ($5.6 million) as his opponent, Republican Joni Ernst ($2.1 million). But the latest numbers show Republican fundraising catching up with, and sometimes surpassing, Democratic totals in Iowa, Colorado and other key states. The Federal Election Commission’s deadline to report third-quarter fundraising totals passed on Wednesday, covering money raised from July 1 through Sept. 30. Comprehensive fundraising totals are not yet available on the FEC’s website, but I was able to find data on most Senate races through local media accounts. In Arkansas, Republican Tom Cotton outraised Democratic incumbent Sen. Mark Pryor $3.9 million to $2.2 million in the third quarter. Republican David Perdue slightly outraised Michelle Nunn in Georgia, offsetting what had been an advantage for Nunn. In New Hampshire, the Republican candidate, Scott Brown, has been closing in the polls of late, and he also raised a pinch more ($3.6 millon) than Democratic incumbent Sen. Jeanne Shaheen ($3.5 million) in the third quarter. Fundraising totals for all states in which I was able to find credible figures for both major-party candidates are included in the table below. As a word of caution, media accounts do not always differentiate between money raised from individual contributions and money brought in from other sources (like candidates contributing to their own campaigns). 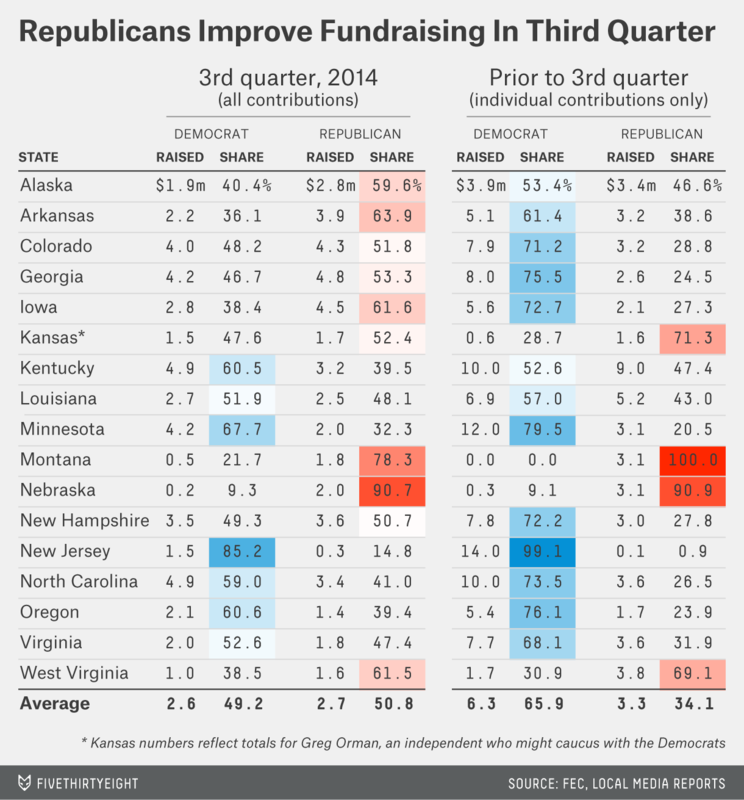 Nonetheless, the GOP’s gains in fundraising are fairly clear. In the 17 states for which I was able to find data, Republican candidates brought in an average of $2.7 million in the third quarter; Democrats averaged $2.6 million, taking away what had been a two-to-one advantage for Democrats through June 30. There are a few comparative bright spots for Democrats. Louisiana Sen. Mary Landrieu slightly out-raised her Republican challenger, Bill Cassidy. Sen. Kay Hagan, in North Carolina, retained her fundraising edge over Republican Thom Tillis. In Michigan, the Democrat, Gary Peters, has moved well ahead of Republican Terri Lynn Land in polls, and Land’s campaign has declined to report her third-quarter fundraising to the media, probably indicating an underwhelming figure. In Kansas, the Republican incumbent, Pat Roberts, whose fundraising totals had been anemic, brought in $1.7 million in the third quarter, roughly matching the amount he’d raised in individual contributions during all previous quarters combined. But the center-left independent, Greg Orman, who could caucus with the Democrats if he wins, nearly matched Roberts, raising $1.5 million. With heavy spending also expected from outside groups, Orman should be able keep pace with Roberts in advertising down the stretch. Perhaps the Democrats’ biggest fundraising success story has been in Kentucky. Through June 30, their candidate, Alison Lundergan Grimes, had brought in slightly more in individual contributions than Republican Senate Minority Leader Mitch McConnell. Grimes also raised more in the third quarter, $4.9 million to $3.2 million. The Democratic Senatorial Campaign Committee has ceased its advertising spending in Kentucky; the move was interpreted as a signal that Democrats were conceding the race. But Grimes and McConnell both have so much money — in a state with relatively cheap media markets — that the DSCC’s spending might have provided little marginal benefit to Grimes. Still, this is a very good set of figures for Republicans. FiveThirtyEight’s Senate forecast model uses fundraising totals as one of the “fundamentals” factors it analyzes along with the polls. The fundamentals receive little weight in the model at this stage of the race, but they nevertheless help to explain some of the polling movement we’ve seen in certain states. In Colorado, for example, the FiveThirtyEight fundamentals calculation had previously made Udall a 2-point favorite over Gardner — contradicting a string of polls that had shown Gardner pulling ahead — but with the new fundraising numbers included, it now has the race even. The fundamentals calculation in Arkansas, meanwhile, now has Pryor as a slight underdog rather than a slight favorite, also matching the polling there.